Cage Damante (Heavener) is a Vietnam vet who became a kickboxer. He signed a contract with the evil gangster Regetti (Rich), but fled from New York City to California to escape him and start a new life. His dream is to be a singer/songwriter on the country music circuit. With the help of girlfriend Ali Webster (Tilton), the troubled Cage may have a future. He also has a strong bond with Legs (Bottoms), a fellow vet and agoraphobic who refuses to leave the VA hospital. Both Cage and Legs are seeing psychiatrist Dr. May (Eggar) for further psychological help. Cage suffers from debilitating flashbacks. Just when things are looking better, Regetti insists that Cage “fulfill his contract” and engage in a “fight to the death” with none other than a dude named Dr. Death (Borja). Regetti even sends his goons after both Cage and Ali in order to force him to fight. Will Cage succumb to Regetti’s demands? Or does he have some tricks up his sleeve? Even though this movie wasn’t written or directed by David Heavener, as many of his later projects were, it seems he’s in the driver’s seat here as the main star and singer of the many songs this movie has to offer. 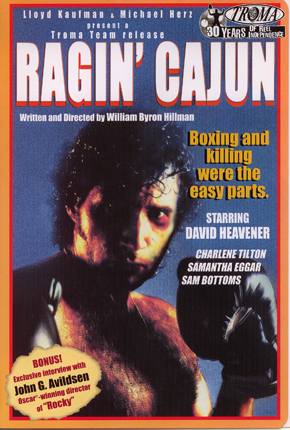 Heavener seems to have plenty of heart here, and Ragin’ Cajun, despite the tagline of “More Blood Than Bloodsport! More Kick Than Kickboxer!” is primarily a drama. Yes, there is some fighting and a smidgen of action, but this could firmly fit in the “Drama” section of your local video store, as opposed to the “Action” section. But Van Damme was huge at the time, so, even though Heavener couldn’t be more different, the marketing people saw an opening during the action boom of the day. Benny “The Jet” Urquidez is on board in a small role as a fighter that takes on “The Cajun”, but interestingly he is billed as “Introducing” Benny The Jet, even though he had been in a bunch of movies before this. Charlene Tilton seems to be giving her all as the devoted girlfriend/singer/guitar player that refuses to give up on Cage. Didn’t she play a similar role in Deadly Bet (1992)? Samantha Eggar is a quality actress and it’s surely a coup that she agreed to be in this. But it truly is a cavalcade of music stars - Tommy Roe, Cristy Lane, Rex Allen Jr., Billy Vera and a few others perform songs, as do Tilton and Heavener, making this almost a quasi-musical. 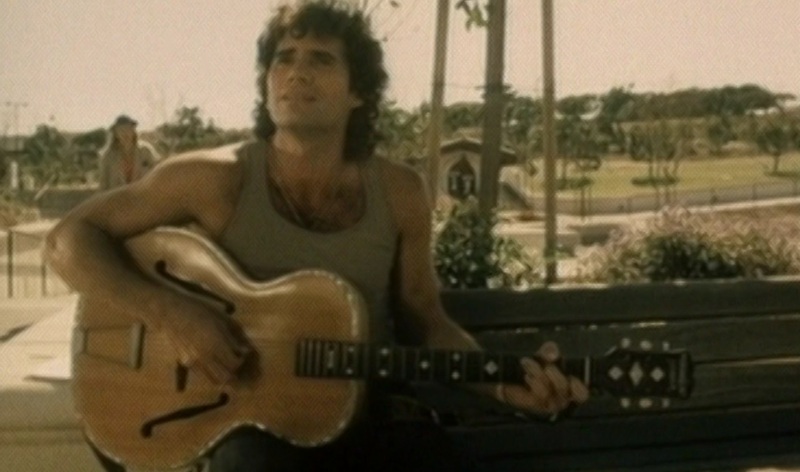 Of course, it’s always funny when Heavener is sitting on a park bench with an acoustic guitar, and begins singin’ and playin’, and mic’d vocals and guitar with effects come strumming out. Seeing as how visions of exploding huts dance in his head, there are plenty of chances for odd editing. But the choppiness in the editing room comes out in other, more unexpected places as well. 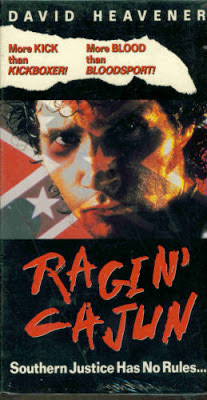 We see what Heavener and writer/director Hillman were trying to do, but this drama/love story/almost-Punchfighter/action/gangster/musical comes out as you might expect - something like a not entirely digested meal. Not that this movie is BAD, but it’s a bit on the haphazard side, and some of the fat could have been trimmed from it as well. Once again, AIP delivers to video stores what others only can dream of. And once again, we applaud them for it. But this Heavener outing is a mixed bag at best. We definitely agree. Heavener was good, but the movie around him wasn't. We have seen Fugitive X, Prime Target and Kill Crazy...reviews coming soon.